Your living spaces are the most important rooms in your home. They’re where you read bedtime stories, have family dinners and make many memories. However, most of these rooms wouldn’t be as inviting or function well without their valuable out-of-sight storage spaces — their closets. Imagine clothes thrown across bedrooms and toys scattered all over the living room. 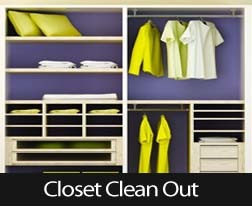 Closets are essential to keeping your home organized, clean and livable. So set aside one weekend this month to tackle your mini storerooms and turn them into orderly spaces with the tips below. Every closet in your home should have a specific purpose, such as a space for only linens, cleaning supplies or coats. Don’t cheat and put the vacuum in the hall closet just because it’s the nearest. Make sure you return items to their proper closet, so you always know exactly where tools or shoes can be found. Whether this means adding shelving or dividers, you’ll want to designate a space for each item. To do this, take everything out of the closet and prioritize it by importance. Then place the most important things within easy reach. This might require a trip to purchase a closet storage system or bins. If there’s anything at the bottom of your priority list left over, get rid of it. If it’s a space you utilize daily, such as a walk-in closet, then make it a pleasure to be in it. Every closet should have good lighting; so install bright bulbs that allow you to see what you’re selecting. If you have a large walk-in closet, you could glam it up and add functionality with funky chandeliers, a built-in ironing board and a specified shoe cabinet. If you have children who need to share a closet, then get creative. Assign them different colored hangers and bins with labels. From bedroom and toy closets to craft and coat closets, you’ll reduce confusion and frustration when everyone has their own space. Reduce your clutter confusion by giving everything in your house its own home. By following these tips you’ll soon have well-organized closets that serve specific purposes and make it easy for anyone in your family to find what they need. If you have more questions about what you can do to put your stuffed closet back into order, call me, your trusted local real estate professional at (905)940-3599 or email me at info@samjia.com for more information.